Turn around the Geo-engineering ship to protect the moratorium! At the beginning of this week, ETC Group learned that the RV Polarstern, a German research ship with a crew of 32 geo-engineers was about to leave Cape Town in South Africa for a 70-day voyage to Punta Arenas in Chile. Their aim is to dump iron sulphate in 300 square kilometres of the Scotia Sea off the coast of Argentina. This is part of an ocean fertilization experiment, code named LOHAFEX, that is co-sponsored by the Indian and German governments. The experiment is targeted for the high seas but there is some concern that the experiment may also affect the territorial waters of Argentina. 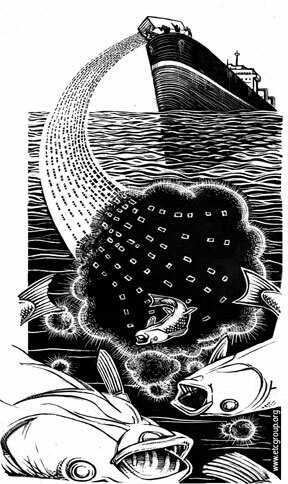 If the LOHAFEX experiment goes ahead, it will breach the global moratorium on ocean fertilisation activities agreed last May by 191 governments at the Convention on Biological Diversity (CBD) and it will defy the agreements made by parties to The London Convention against dumping of wastes in the sea (a treaty of the International Maritime Organisation). You can read more about the Lohafex expedition and how it is breaching the moratorium here. ETC Group and our allies in Germany, India, South Africa, Argentina and the EU have spent this week raising our concerns with the three governments sponsoring and aiding this illegal geo-engineering experiment: Germany, India and South Africa. We have requested that they respect the moratorium they agreed to last year and instruct the Polarstern to turn around and unload its cargo of iron sulphate. We have yet to receive any official reply from the governments involved. Live tracking of the RV Polarstern via the Internet shows that the geo-engineers are still headed full steam for the Scotia Sea. Keep up the pressure and encourage others to write to the German, Indian and South African governments until we see the RV Polarstern turn around to the port. Please write to the Ministers of Environment in Germany, India and South Africa expressing your concern and requesting that the RV Polarstern return to port and offload its cargo of iron sulphate. You may also wish to point out that geo-engineering approaches such as ocean fertilization are the wrong response to solving climate change and could further damage and de-stabilise ocean ecosystems and the climate. Please consider copying any emails to info@etcgroup.org so that we can track how many people have expressed their concerns.